Hi everyone. 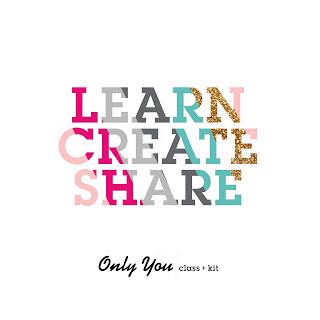 I'm here today discuss my favorite topic - DIY Party Decor. 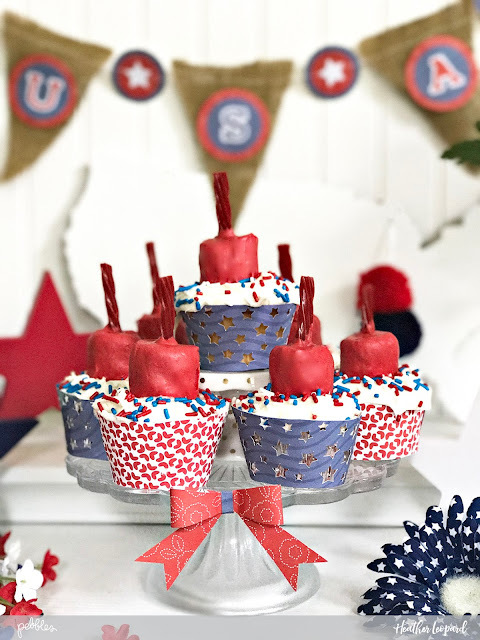 Whether your planning a mini celebration or large scale with all your family and friends, these ideas are sure to create a SPARK this 4th of July! 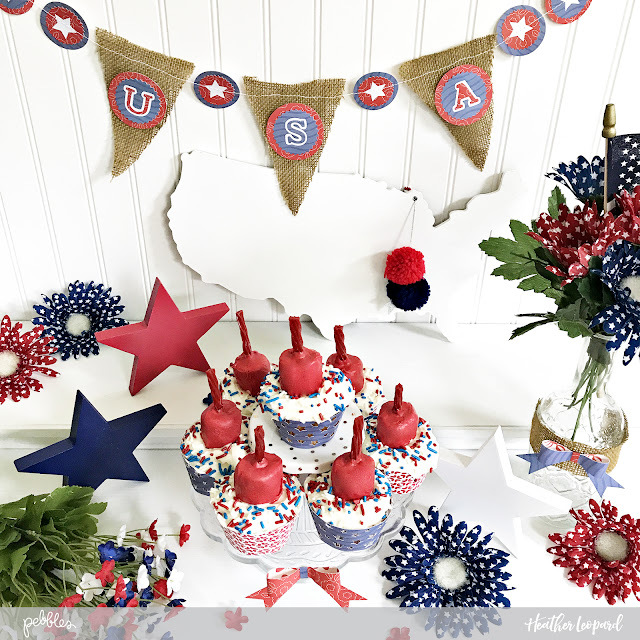 The theme for this particular party is red, white and blue for Independence Day here in the USA but all you have to do with swap out colors and patterns and you have a recipe for success. Today's party details include a fun backdrop, table decor and oh so fun firecracker cupcakes because it's not a party without a "poppin" dessert! To create this banner, cut two 2-inch red circles and five 2-inch blue circles, two 1.5-inch blue starbursts, five 1.5-inch red starbursts, seven 1-inch stars. Those will make up the "dividers" for the banners. Adhere them together as shown above. 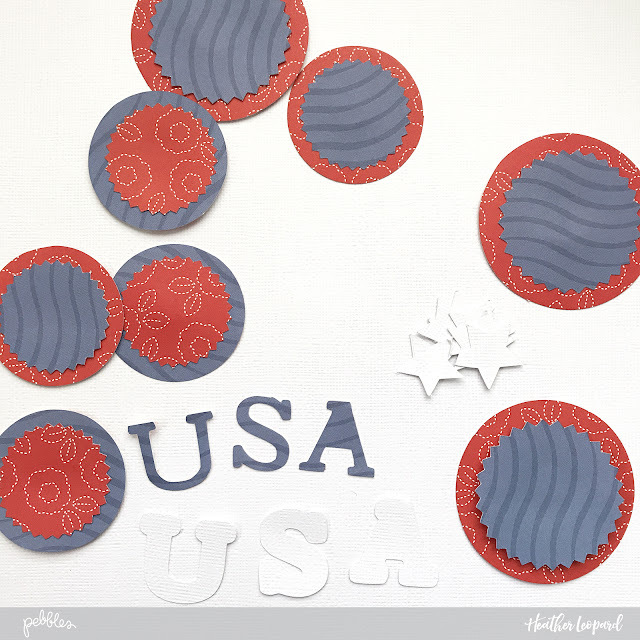 For the USA, cut three 3-inch red circles and three 2.5-inch blue starbursts. Adhere the blue starburst over the red and add "USA" alphas. 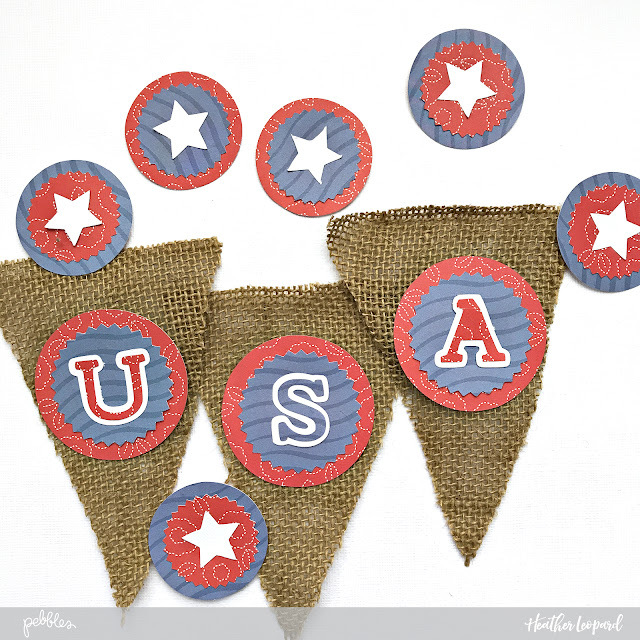 Using your sewing machine, stitch the banner together as you would garland, backing the "USA" bits with burlap triangles. First, determine how many cupcakes you'll have. Set aside one medium sized marshmallow for each cupcake. Also cut your twizzlers down to 3-inches and set aside. Dip each marshmallow in the red melted candy and immediately stick the twizzler in the top before the candy melt dries. Add white icing and sprinkles to your cupcakes. Add the red marshmallow firecracker to the top. 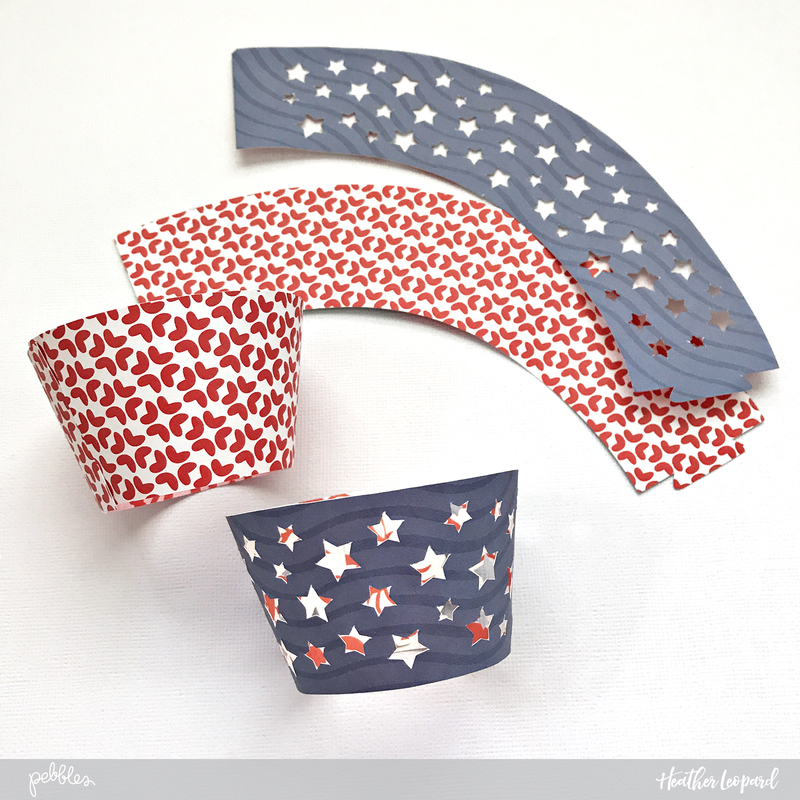 Create festive wrappers for your cupcakes. These just make it a bit more fun and decorative because they match the decor perfectly but you can also purchase fun wrappers. You may consider adding additional decor. 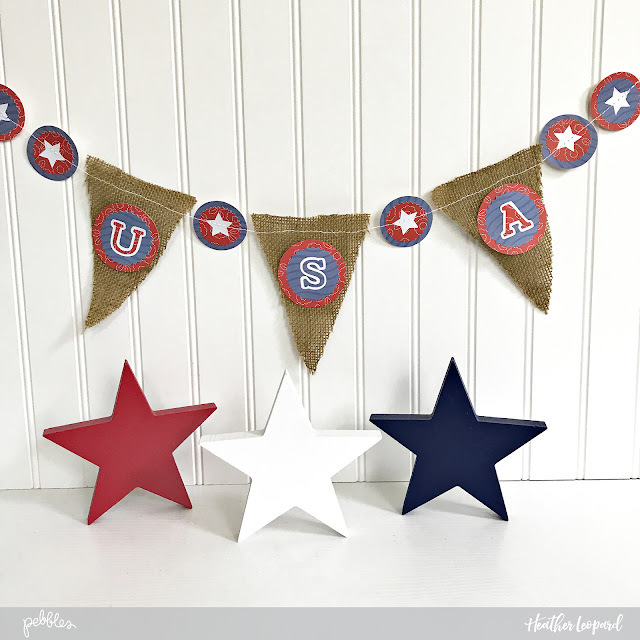 I added burlap and bows to the floral decor and cupcake stand and then I brought in additional elements, like wooden stars, United States cut-out, etc. to tie it all together! Hi everyone. 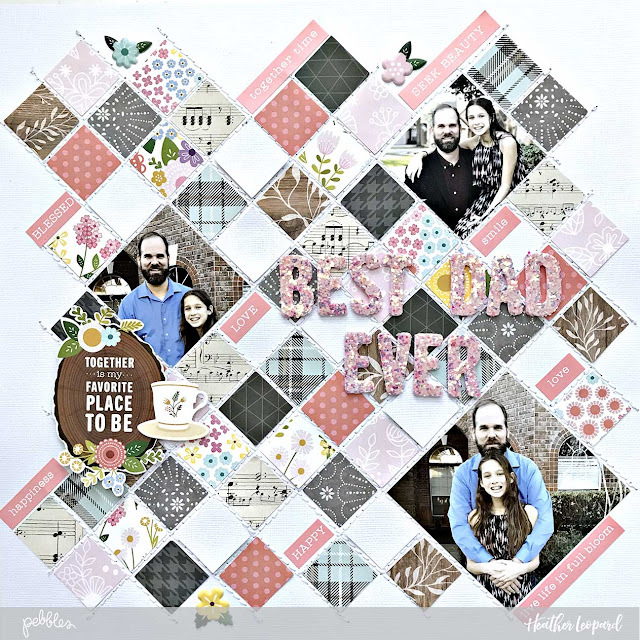 I'm here with a Father's Day scrapbook layout and free Silhouette cut file. I realize Father's Day was last month but I also know you have been busy this summer and might finally be getting some scrappy time and hey, why not scrap those father celebration photos?!?! I chose a masculine vibe because it is all about dad, you know. 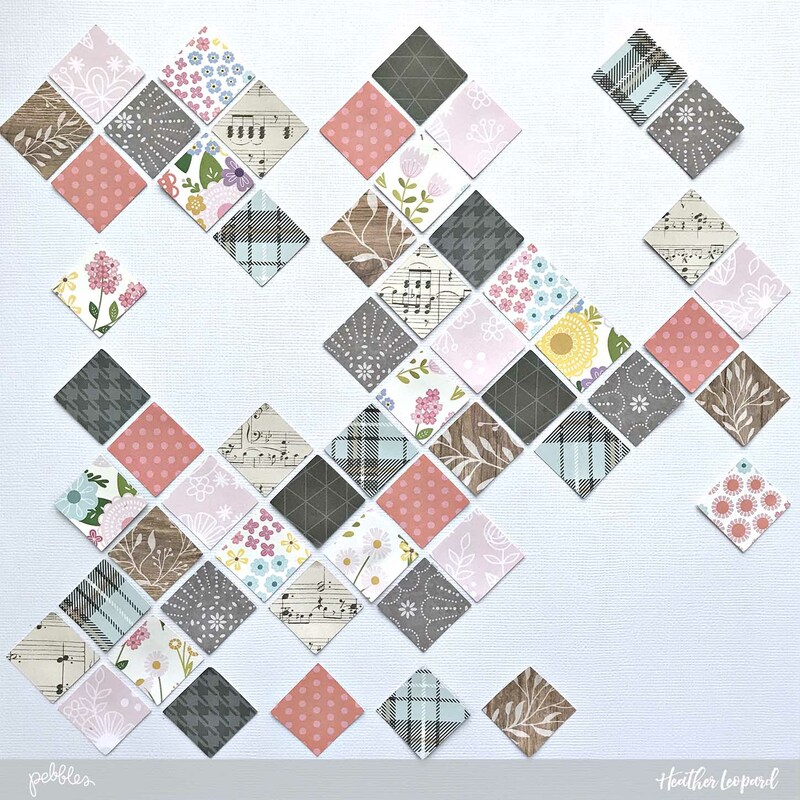 To get started you'll need to punch 1-inch squares or download my free Silhouette cut file HERE. If you'd like, add machine or hand stitching. I chose to do straight lines at a diagonal going both ways. Next, add your photos. 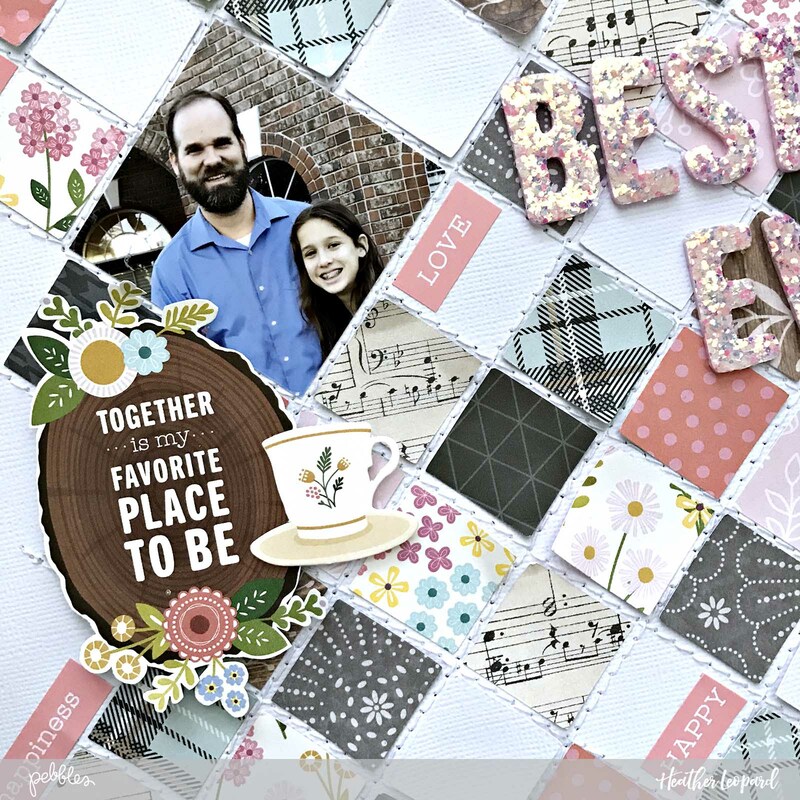 If you are using my template, I made it so you can use two 2"x2" photos and one 3"x3" photo. 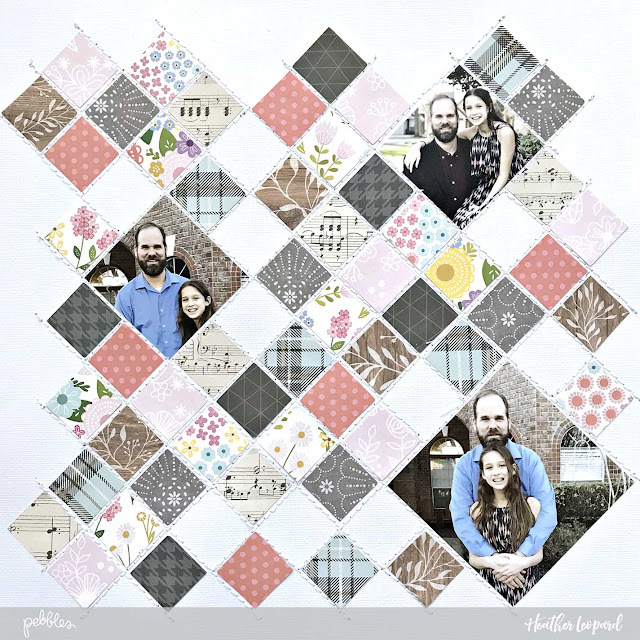 Add your title right over the squares, between your photos. Next, add embellishments, such as cardstock stickers, puffy stickers, die cuts and more. 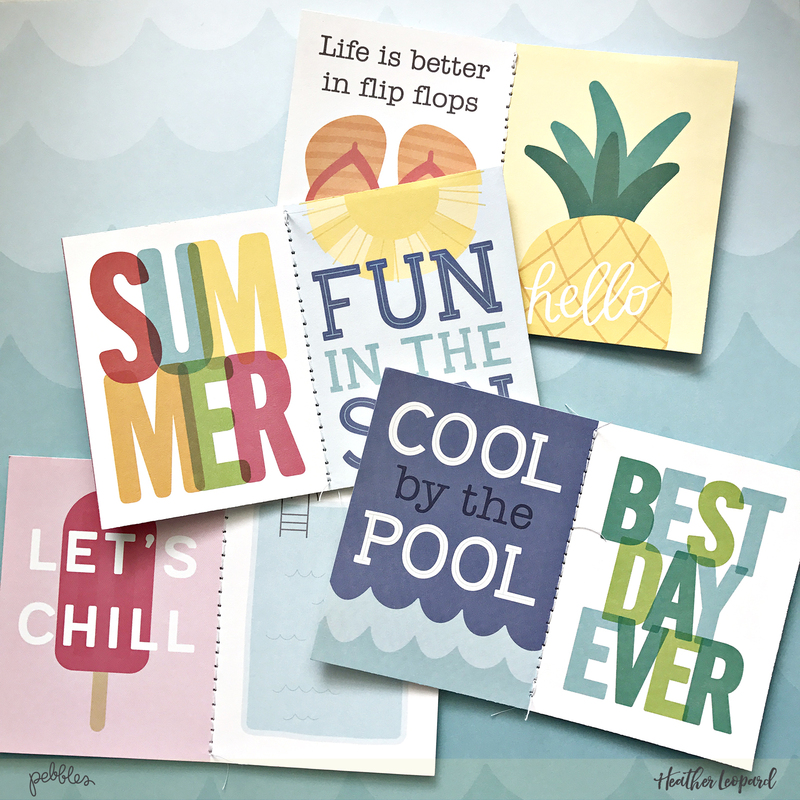 Finish it off with journaling. 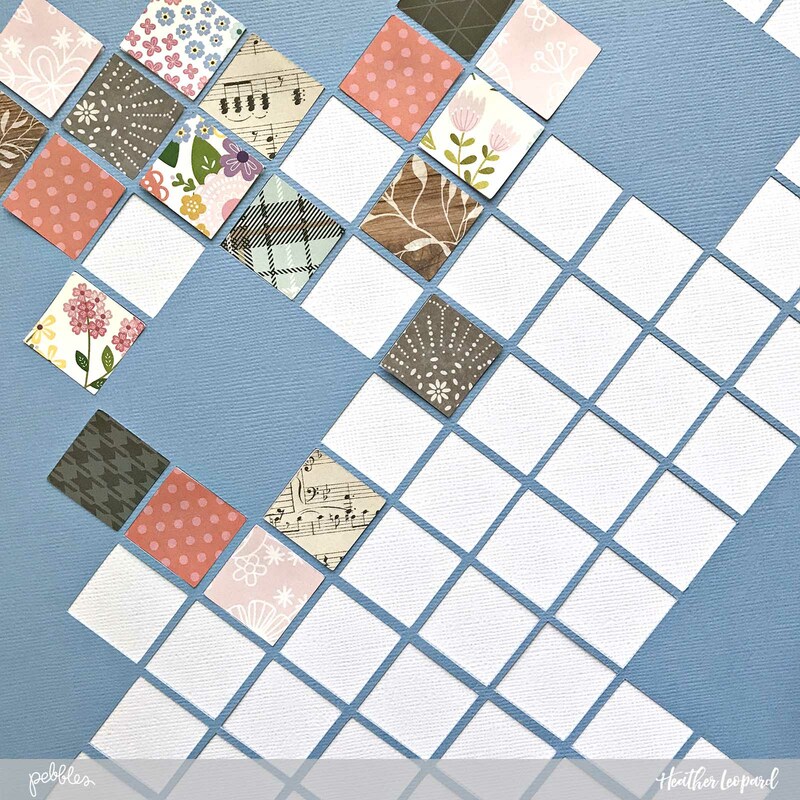 I plan to add my journaling around the edge of the layout, or perhaps in the empty squares. I'm still debating. Another alternative is that you could also do one less photo and use one of the photo spaces for jouranaling. 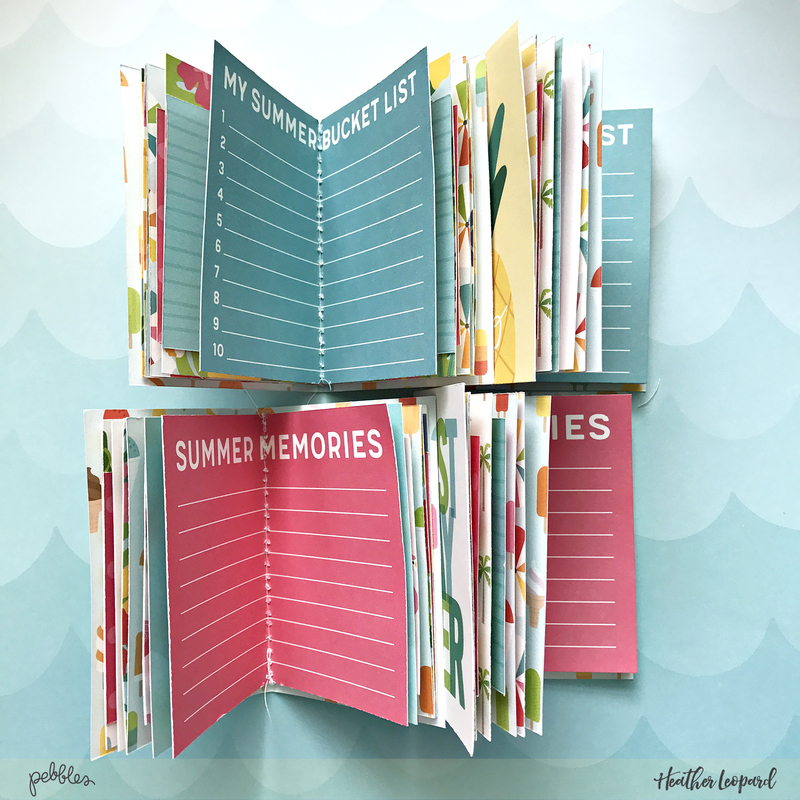 Hello everyone, I'm here to share a quick gift idea: Mini Summer Traveler's Notebooks! Not only are mini summer traveler's notebooks a fun way to document your summer adventures, but they are so quick and easy, you'll want to make a lot! 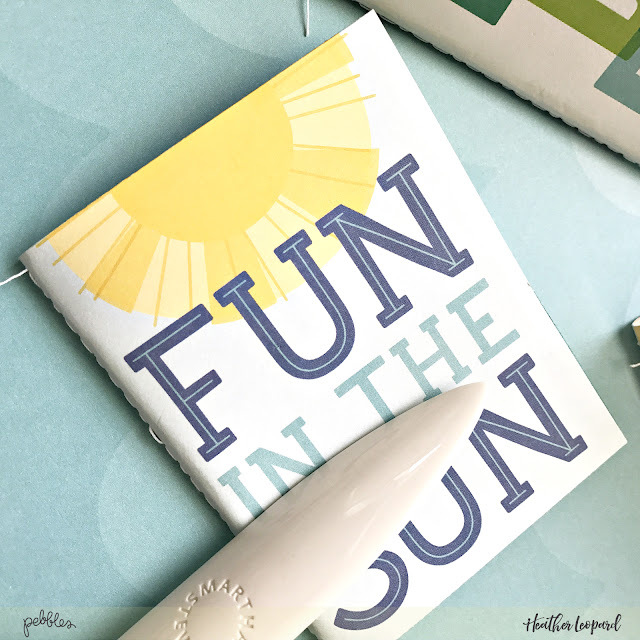 We're taking a trip this summer with some friends, so I made mini summer traveler's notebooks as gifts to give to the kids using Pebbles' new summer line, Sunshiny Days. I plan to take my little handheld printer to snap random shots and let them add them to the pages and add notes about their adventures. 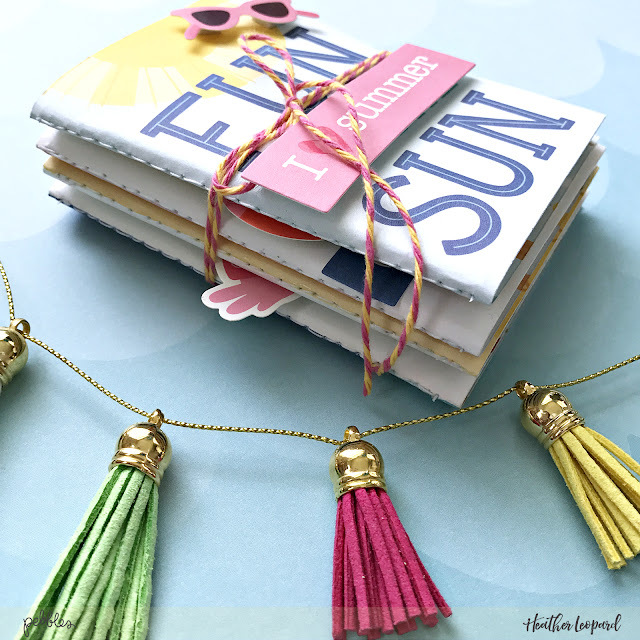 As I mentioned, these mini summer traveler's notebooks are very easy to make...let's take a look. 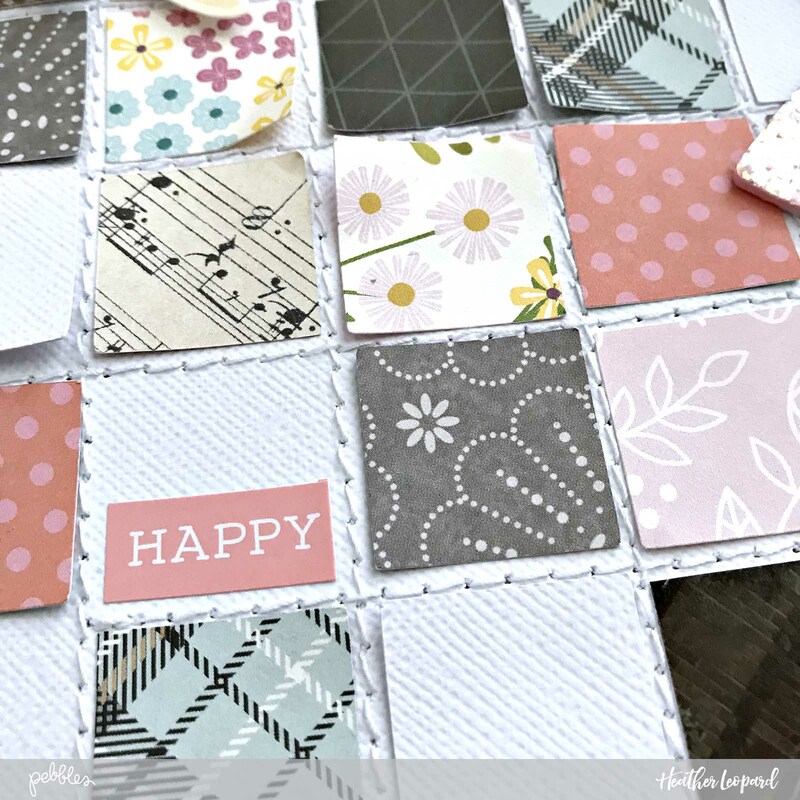 Start by cutting 4" x 6" covers. I chose to use the patterned paper with the journaling cards for a cute front and back cover. 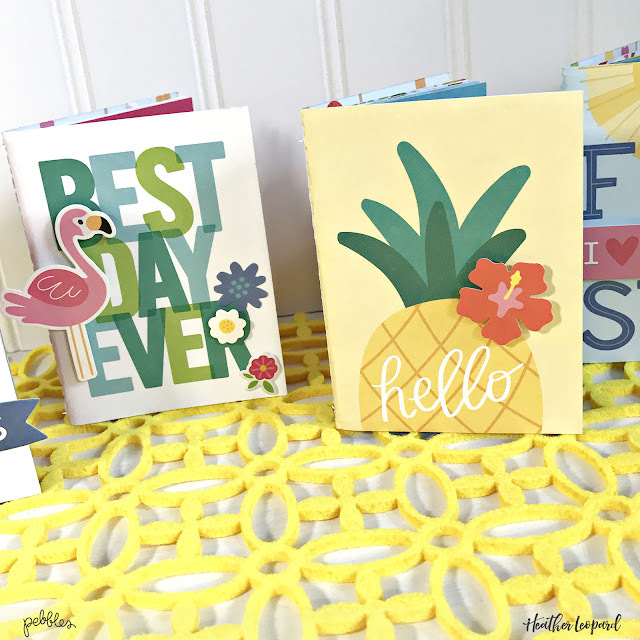 Next, cut the inside pages using coordinating patterned paper or plain cardstock. Consider cutting them at varying sized to add a fun flair. Also, cut them 1/2" smaller on the top and side so that they are 1/4" smaller around each edge. 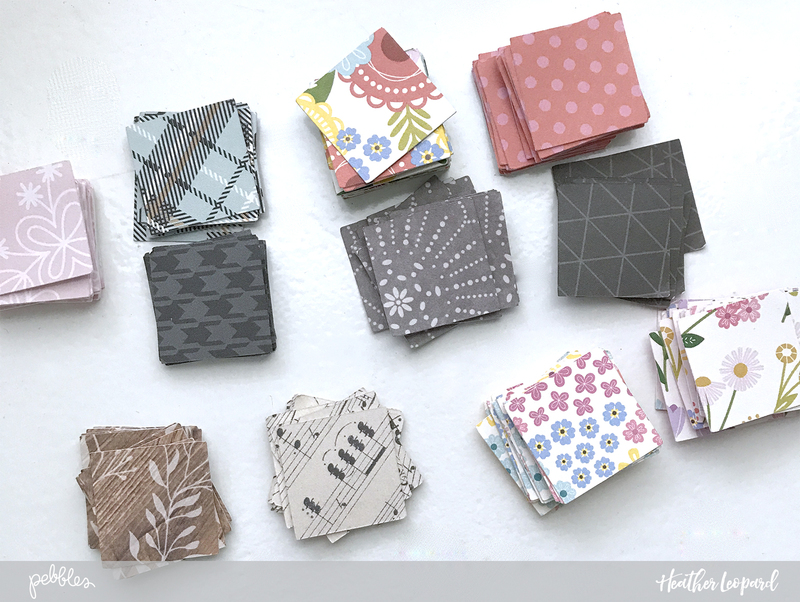 After you've sorted your inserts in the order you want them, run them through your sewing machine and stitch right down the middle. Make sure they are all facing the right way up. Using the journaling cards with the divider lines makes this very easy to do! Fold these in half. You may want to use a bone folder to get an extra crisp fold. 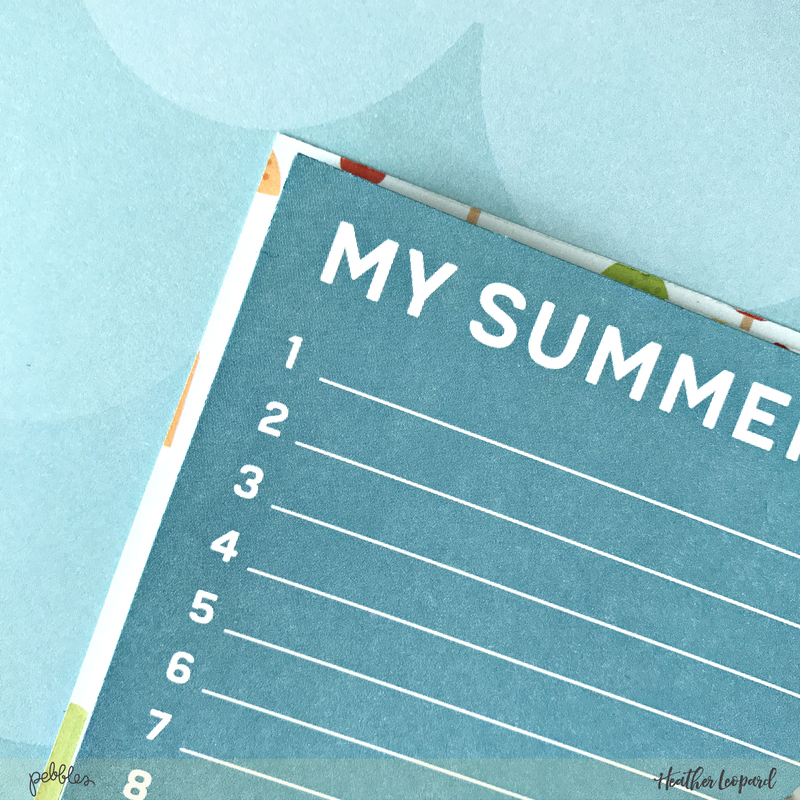 I used a supersized journaling card as the inside center card for my summer traveler's notebooks. This can be used for a summer bucket list, bullet list, end of summer storytelling, or whatever. 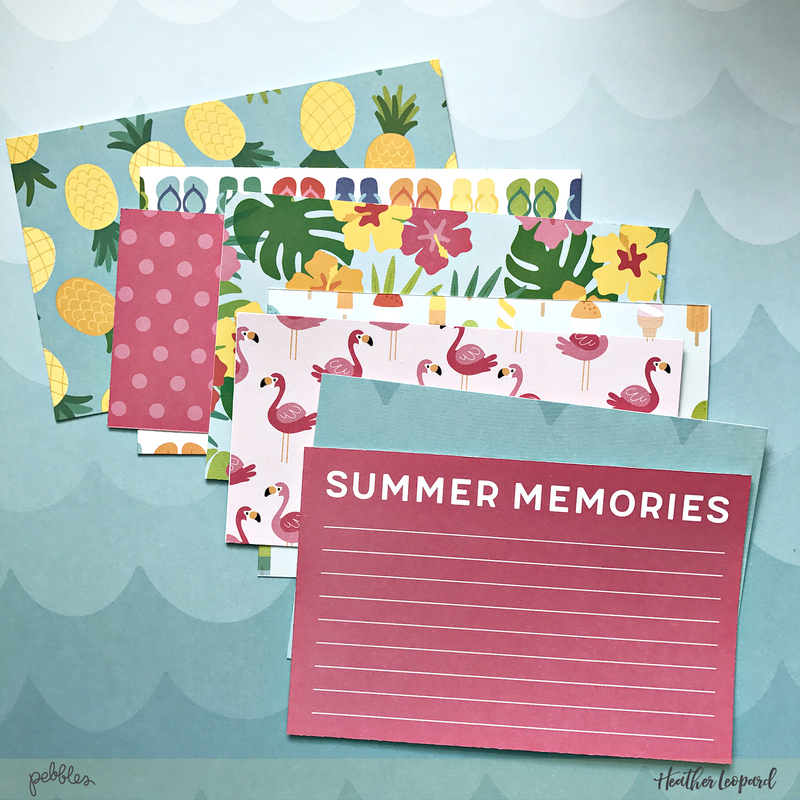 Once you've assembled your mini summer traveler's notebooks, decorate the outside with stickers and embellishments. 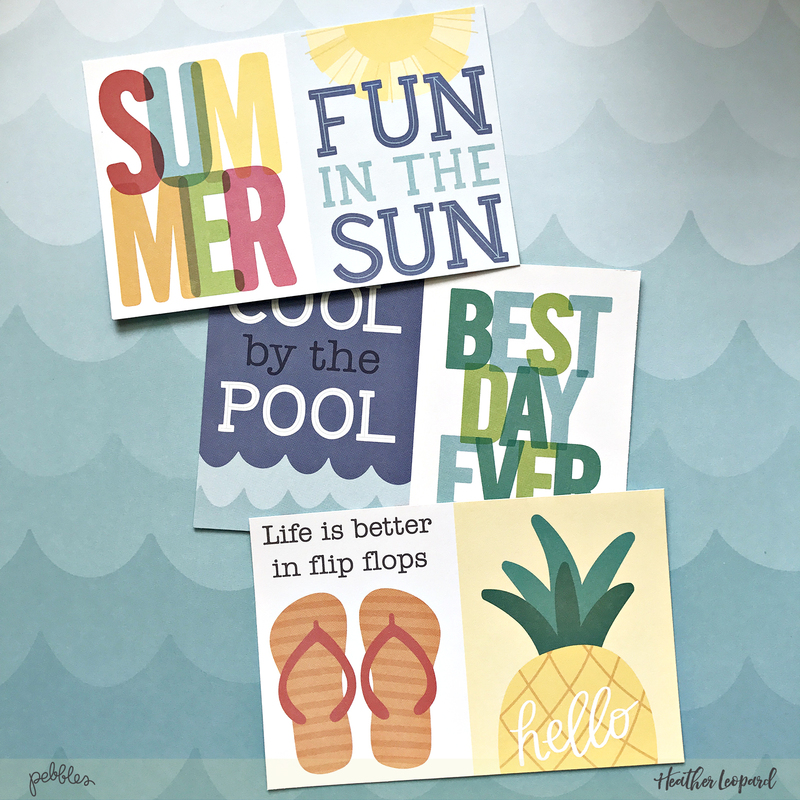 You may even wrap these up with stickers and embellishments for the recipient to add once they have their photos. These only took about 45 minutes to whip up all 4 -- I wasn't kidding when I said these are a quick and easy gift idea! 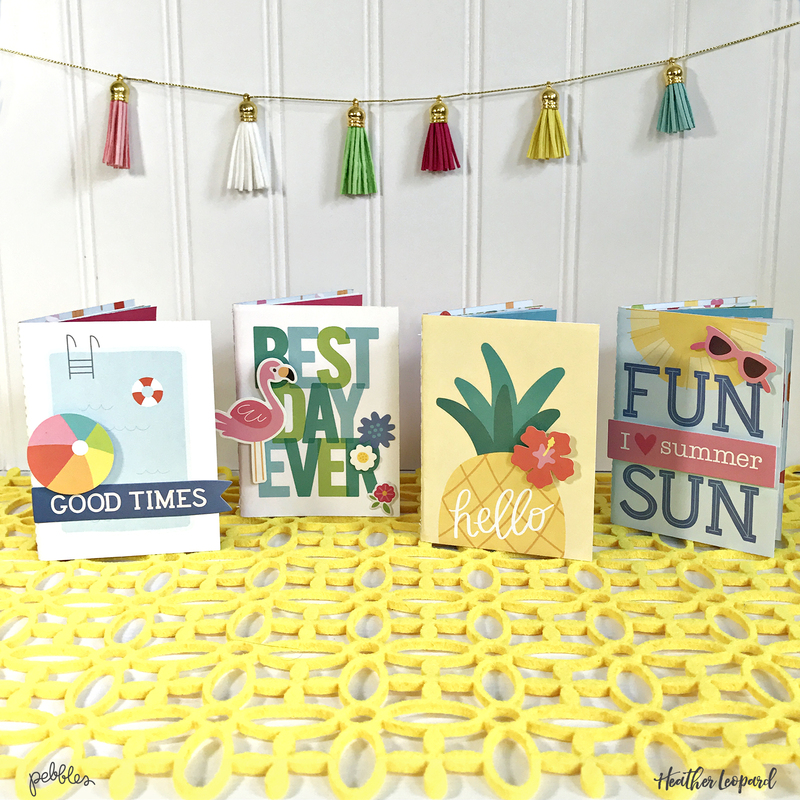 Thanks for stopping by the Pebbles' blog today!